This document is still being tweaked, but there is enough here to get you to a reasonably complete state. Extend at least one of these programs to support viewing images stored in the cloud. Delicious might be a good choice for this. Create a new program called Week08-Midterm. The program should integrate Delicious, Bitly and Twitter. NOTE: I have pulled this section of the midterm as too ambitious: **View a *gallery of images created from Bitly or Delicious links and Twitter posts. * We will do this before the quarter ends, but not yet. Create a new project based on Week08-Single-Page-Express. Alternatively, copy your Bitly Refine or Twitter Refine application into a new folder labeled: Week08-Midterm. If you copied a project, make all the appropriate changes regarding the name of the application. When changing the title in /routes/index.js make sure to include your name. For instance: midterm-lastname. When the buttons are selected, search Bitly, Delicious or Twitter for your images. These means you need to create groups or hash tags in Bitly, Delicious and Twitter that will return the results you expect. For instance here is a possible twitter tag for my images: #calvert-images. For better of worse, I have changed elfDownloads.getBitlyData to elfDownloads.getLinks. These tests are similar to the midterm tests, but not identical. Then copy the tests from the Templates/UnitTest/Isit320Midterm2015 directory to your spec folder and make sure they all pass. The goal here is to help you complete the midterm, but getting the tests to pass also effects your grade. And so on. I'm not concerned about the name you give you the test files, only that I can easily tell your tests from my tests. Also, this will ensure that your custom tests are not lost when copy tests from JsObjects. At some point in development, you want to take most of the jade from Week08-BitlyRefine and put it in views/bitly.jade. Don't link in layout.jade with an extend statement. Update your Bitly, Delicious and Twitter projects. Create and complete as best you can the midterm, placing it in the folder specified above. Below are various hints, suggestions and details that will help you complete the midterm. Make sure the dashes work. I tried this on Bitly: elf-image. It did not work. But image did. I assume the trouble was the tag. Display the images in a clickable list. When the user clicks on an item, display the image. You have seen a variation of the first method before under the name appendUrl. It is used to wrap a bit of text in an anchor. This makes it clickable; it turns it into a hyperlink. The second line of code in the method sets the src attribute of the img element. This is all that needs to be done to load the image. If you are at all unclear on how the img tag and its src attribute work, please take a moment to do some research on the web. You have to understand those subjects to understand this code, or to continue doing any kind of serious work on the web. 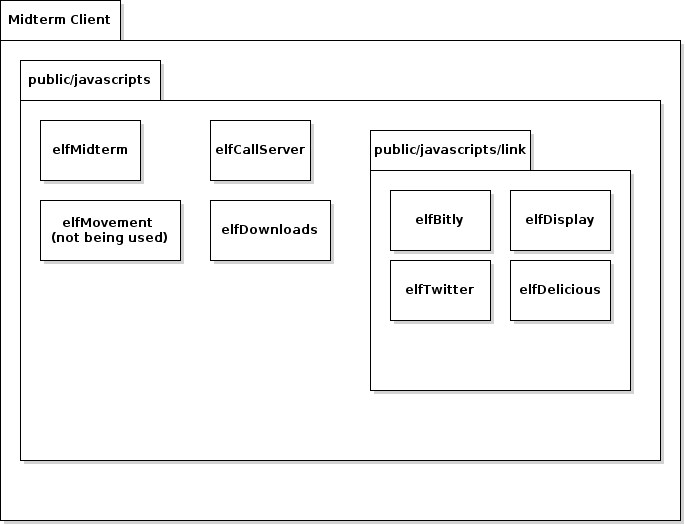 NOTE: In my implementation, both the hyperlinkUrl method, which you have seen before, and the displayImage method, are part of the elfDisplay object. Of course, you will have to load this code in layout.jade as shown below. Uncomment the second line and change favicon.ico to favicon.png. Now the error should go away. You can use any image editor you want to modify the favicon.png file. On Linux, the tool of choice is called gimp, but simpler tools will probably a do simple job like this just as well. Now our document ready function will get loaded when we run our program, but not when we run our tests. If the user chooses either local or cloud bitly, then elfCallServer.loadBitly is called. If they choose delicious or twitter, then similar methods is elfCallServer are triggered. Calling the server to ask it to transform JADE into HTML and to send it to us via HTTP. For instance, delicious.jade becomes delicious.html. Call a setup method that ensures that the buttons and other controls for programs are properly initialized. The one exceptoin is bitly which still just uses the downloads object to set up its display. This will need to be changed in a later version. A discussion of how to find and store images will be on elvenware in cloud/FindImages page. 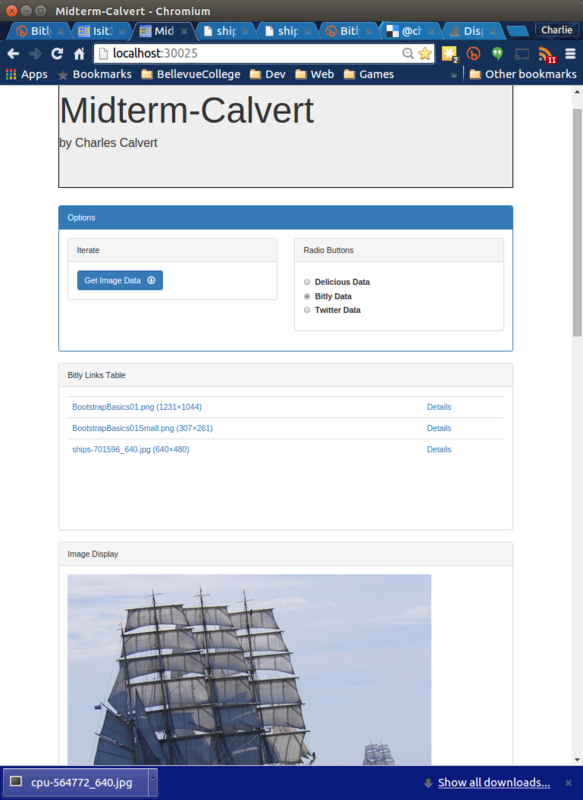 For now, however, you can find it on ccalvert.net. Or run npm install after editing package.json by hand.